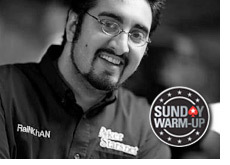 Hevad Khan, a member of team Pokerstars who rose to prominence during the 2007 World Series of Poker main event, took down the Sunday Warm-Up on Pokerstars this week. He took down an impressive $98k for his efforts, outlasting 2503 other entrants en route to the first place prize. Khan, as you can imagine, was quite pleased with his victory. One can only imagine the different chants, dances and gesticulations he was doing during the final table of the event. If you saw his antics during the 2007 World Series of Poker then you surely know what I mean. Khan took down 6th place at the 2007 World Series of Poker main event which was good for sixth place. Khan became famous (or infamous) during the main event for his excessive celebrations after winning major hands. Khan's celebrations were so over the top that the World Series of Poker tournament organizers have actually changed some rules to eliminate the over-the-top antics for 2008. Khan has continued his steady play since then, cashing in a total of seven live tournaments. Khan is also famous for his insane SNG multi-tabling sessions. He was banned a while back by Pokerstars after it was suspected that he was in fact a bot. I mean, nobody could possibly play 20-30 SNG's at once could they? Khan wanted back on the site so he made a video in which he was taped playing an insane amount of SNG's at the same time. Pokerstars relented and let Khan back on the site. It's ironic that the site that banned Khan ended up signing him to a sponsorship deal. This is Khan's biggest online tournament cash ever.